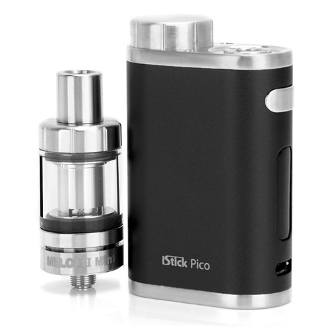 The iStick Pico Kit is a mod device with an overall classic look. It supports 18650 battery platforms and is a smart device with a passthru function. The Pico Kit can reach 75 watts and supports nickel, titanium, and stainless steel for both wattage and temperature control mode. The watts are completely customizable and can be viewed on the Pico's bright OLED screen along with the atomizer resistance, battery life, and temperature output(if in TC mode). The Melo 3 mini Tank is a feature of the kit and be filled through the top. It also shares coils with many Tanks and therefore is easy to keep fresh and updated.